If there's one thing I'm most bummed about this summer, it's that I missed out on our local strawberry season. Normally I go strawberry picking each year at the fields located on the border of Wisconsin and Illinois. This year, the season's crop started late and ended pretty quickly. During that time, my schedule didn't allow me a chance to go and visit... or the weather just wasn't ideal for picking. So I ended up taking advantage of the strawberries on sale at the grocery stores. It definitely wasn't the experience I wanted for strawberries but eh, what can you do? So when I was asked to attend a special strawberry event downtown, I was thrilled! 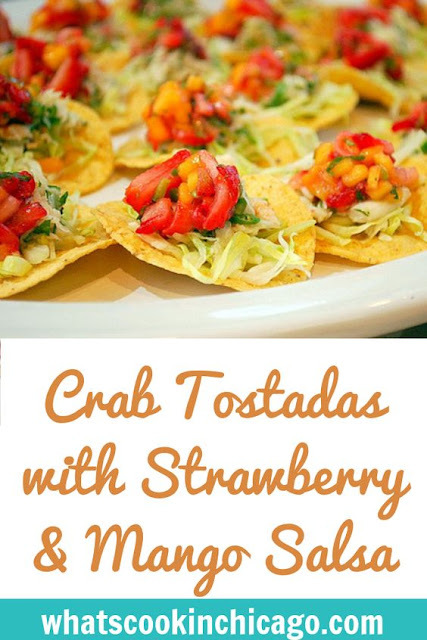 I'll be sharing more about that event soon, but in the meantime, I had to share my favorite dish of the night - Crab Tostadas with Strawberry & Mango Salsa. The sweetness of a lump crabmeat salad paired perfectly with strawberry mango salsa atop a crispy corn tostada. It's colorful, refreshing and perfect to enjoy summertime strawberries! 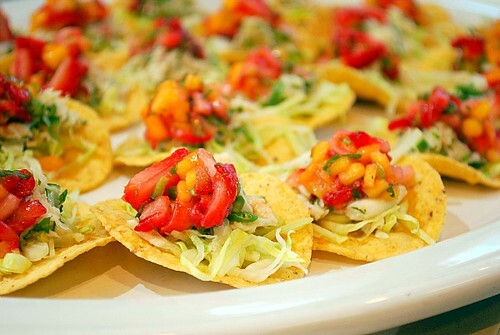 ooo Joelen those tostadas look fabulous! A refreshing summer recipe for sure. Seems the whole country is in turmoil with this crazy weather, it's no wonder the strawberry season was off kilter. So fun to see you the other night! This looks like a must bookmark recipe for me!